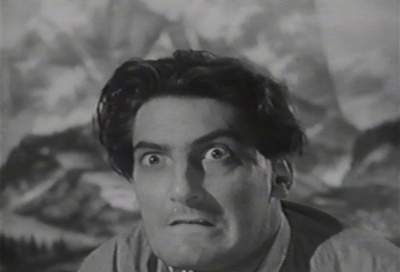 One of the very best, if not the best, alien invasion movies from the 1950s is a Brit picture called THE TROLLENBERG TERROR (1958). Not familiar with that one, you say? 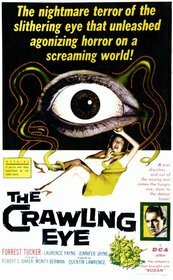 Perhaps you’ve heard of it under the name they slapped on when they exported it for consumption by us more-literal minded Yanks, THE CRAWLING EYE. Some commentators have castigated this change of name for giving away too much of the plot, but really, although THE TROLLENBERG TERROR is a decent enough title, who among us wouldn’t rather see THE CRAWLING EYE? Doesn’t that rachet up the anticipation? Doesn’t it just make you think, man, I really want to see how an eye can crawl? I know it did for me when I was a kid. I highly anticipated the Crawling Eyes, and I wasn’t disappointed. This was one of those movies I first saw on CREATURE FEATURE or maybe SCIENCE FICTION THEATER when I was a kid and I revisit it every now and again and it holds up quite well with a few qualifications which I suspect are mainly attributable to budgetary limitations. It starts off with a bang in an intense opening scene as a couple of college kids are climbing the Trollenberg, which is located in Alps or some other Aryan vacation spot, and one comes up quite unexpectedly missing his head. 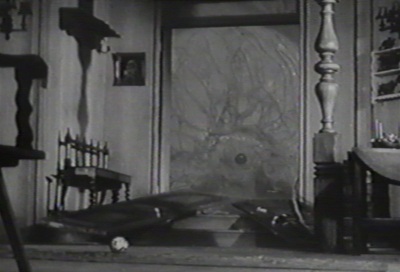 This becomes a common theme in the film. We don’t actually learn a whole heck of a lot about the Crawling Eyes, but it does seem that they enjoy collecting heads. Their very mysteriousness adds to the growing suspense. We never learn where they’re from, their precise motivations for coming to Earth, or even exactly what they want (except for the occasional head). They make no real attempt to communicate with us. They’re just bad-asses out for our heads and presumably our mountain tops, perhaps, as the scientist opines during the film, with an idea to migrating to warmer climes when they become accustomed to conditions on our planet. 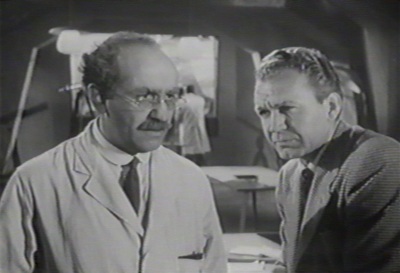 Forrest Tucker (below right), the gratuitous American in a cast filled with Brits, plays the hard-nosed U.N. investigator Alan Brooks. As he’s unpacking at the hotel that’s one of the film’s foci of action, we catch a glimpse of a gun in his suitcase, and current viewings of the film remind me how times have changed. I doubt that nowadays even U. N. Investigators would go around casually concealing firearms in their suitcases. It seems that Tucker is friends with Prof. Crevett (Warren Mitchell above left, who has IMBD credits dating as late as 2006), a local scientist who has a bunker-like observatory partway up the Trollenberg where he studies cosmic rays. Crevett has summoned Tucker because of suspicious activities that remind him of the ominous “Andes incident” that he and Tucker were once involved in. Gradually it becomes clear that this “Andes incident” was another invasion, perhaps a scouting party or dry run, that eventually petered out. Tucker wrote a report that got him in hot water with the muckety-mucks upstairs and this time he vows he’s not putting his neck out again until they have solid evidence. Well, it doesn’t take long to gather same. A pair of hikers, a geologist and a well-known mountain climber, go up the Trollenberg to try to get some evidence as to what’s causing all these nasty accidents. That night in the way station hut, the geologist’s head disappears, as does the entire mountain climber. The climber shows up at the hotel the next day, looking wild-eyed and acting weird, claiming he’d gotten lost. In a tensely effective and evocative scene, Tucker plies him with cigarettes and booze, but he fumbles with matches and while pouring a drink as Tucker and others look on. The audience realizes that something is wrong. Suddenly uber-cute Janet Munroe comes down the stairs. She is Anne Pilgrim, part of a sister psychic act. And she’s really psychic. A strange mental compulsion had forced her and her sister to stop and get off the train with Forrest Tucker at Trollenberg, and she’s been acting mighty strange ever since, like trying to go up the mountain dressed only in a trench coat and her pg’s. The climber draws a big old knife and goes after her, and only a smack on the jaw from Tucker saves her. Apparently, as in the Andes, the Crawling Eyes don’t like psychics. The aliens take over human proxies and send them after those with arcane mental abilities (again, why we’re not sure). The Eyes move under the cover of a radioactive cloud that apparently they shift by will or machinery (although we never see them utilizing any kind of equipment) across the landscape. And the cloud is descending on the village. Tucker and his scientist pal get the villages to hoof it up to the observatory for safety, leading to one of the iconic images of ‘ 50s sf movies. Everyone but the last group has taken the cable cars up to the observatory, but Tucker goes back down to the hotel after a wandering child (of course) and gets there just in time to see the front door busted in and, framed in the open doorway, we finally see revealed in all its hideous glory, the Crawling Eye. And the SFX people, considering technical limitations of the day, really deliver the goods with this one. A twitchy, veiny eye set in a featureless, bumpy dome of a head, resting on a nest of snaky tentacles. Practical? Probably not. Scary? Hell yes. Tucker goes to work with a climber’s ice-pick, saves the girl, and they heigh up to the observatory to face the Crawling Eyes’ final assault as well as the depredations of another human agent who manages to sneak in. 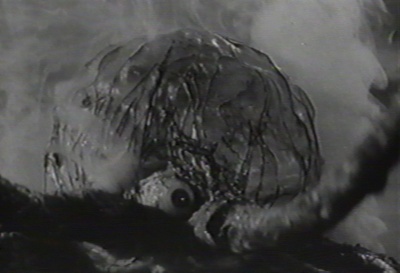 All of this is handled with great skill by the director, wrenching every ounce of tension out of the confrontation that he possibly can, though it must be said that the SFX do fall down a little, mainly when it came to depicting the Eyes in motion (they don’t so much as Crawl as they Glide) and in some inferior miniature work. But in the end, this is an extremely satisfying alien invasion movie, well acted (though Forrest Tucker had a tendency to cover his face with a hand when real emotion was called for), and extremely well directed and scripted. Actually, I wouldn’t mind seeing a remake in this age of fabulous effects, if they could keep the other aspects of the film at the level this version achieved. Oh, and for a bit of continuity fail, keep your eyes on the newspaper Tucker’s reading in the train scene when you view this movie. As you should. Soon. It’s readily available on cheap DVD releases. This movie rates a well-deserved 9.